We’ve been looking for a corn chowder recipe to add to the “permanent” on-demand recipe collection but most are geared toward summer when fresh corn on the cob is abundant in the Midwest. This allows you to use the rich pulp, corn juices, and kernels to create a delicious, thick chowder that can be eaten on summer nights with a French baguette, preferably on the porch with a glass of sweet tea as your family and friends sit and talk with kids running around in the background. Unfortunately, sometimes you want a good corn chowder in the middle of winter when fresh corn on the cob isn’t available. 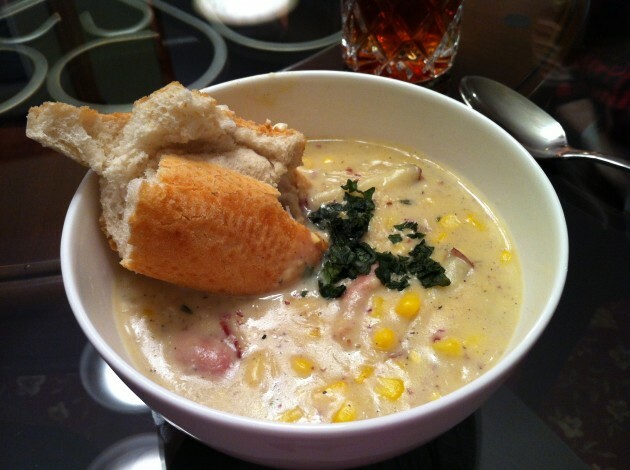 [mainbodyad]The goal for two nights ago was to find a way to modify a good corn chowder recipe to use frozen corn kernels as a substitute during the out-of-season cold periods. Not only did it give me another excuse to try the new Staub Dutch Oven following the red wine beef stew I made the other night, it gave me an opportunity to test the degree to which we could tweak an already good corn chowder recipe for less-than-ideal conditions (e.g., when the freshest ingredients simply aren’t available due to seasonal factors). It was a huge success! The results were well worth the effort and far better than the last corn chowder I had ordered from room service during our mini-adventure iPad-release-campout last year. Next time we are going to try to introduced some sort of flavored, marinated, and shredded chicken and possibly test out different types of pepper. I’m convinced that somehow the chemistry can be changed to introduced cheese along with the shredded chicken, but then it is no longer a corn chowder. This is on my “figure out” list sometime this year because I think it could be phenomenal, especially if paired with a giant piece of olive-oil toasted bread covered in fresh bruschetta. First, start with the prep work. The corn chowder is going to be much easier if you have everything ready before you begin cooking. 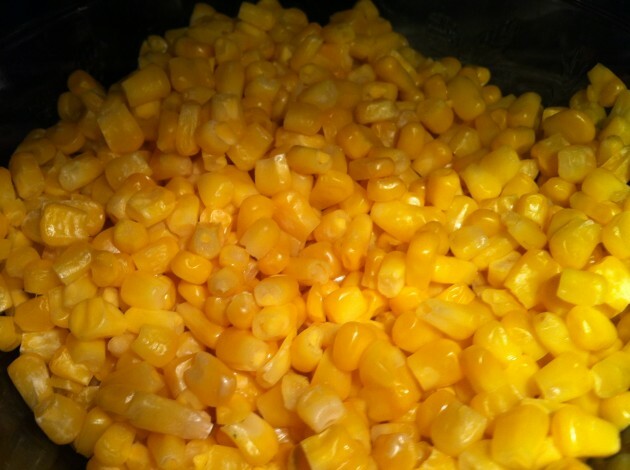 Add 5 to 6 cups of frozen corn kernels to a microwave safe bowl. Defrost until the kernels are near room temperature and no longer cool to the touch. For your corn chowder main ingredient, you need 5 to 6 cups of corn kernels. You need to prepare 5 bowls of ingredients. Taking this step now will save you a lot of time and effort when cooking the corn chowder. Trust me on this. Bowl #1: Add 4 slices of bacon, cut into 1/4th inch pieces, 1 whole white onion chopped into fine pieces, 2 teaspoons of minced fresh thyme, 2 teaspoons of salt, and 1 to 2 teaspoons of fresh ground black pepper depending upon how spicy you want the corn chowder. Bowl #2: Add 1/4 cup all-purpose flour, unsifted. Bowl #3: Add 5 cups of cold room temperature water. Bowl #4: This is your corn bowl. Right now, you have your 5 to 6 cups of corn kernels in it that you raised to room temperature in the microwave. Add 3/4 pound of small, red potatoes that you have cut into 1/3″ to 1/2″ pieces, depending upon your preference. Bowl #5: Add 1 cup of half-and-half or heavy cream, depending upon preference. Make sure you have a whisk, sugar, a blender or food processor, and fresh basil on hand for steps we’ll take later, once the corn chowder recipe is almost finished. To make sure the timing could be perfected, I prepared all of the ingredients in bowls based upon when they needed to be mixed into the corn chowder. It took a little more time but the results were worth it. Here were three of my five bowls, sitting out and ready to be added as I needed them. 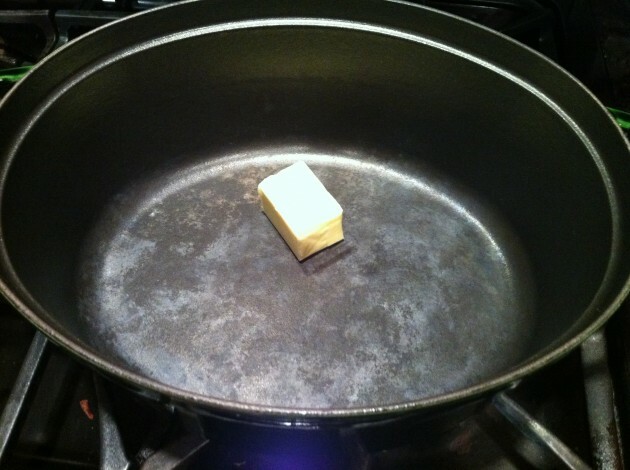 Put a Dutch Oven over medium heat, melting 3 tablespoons of unsalted butter. For our corn chowder recipe, we used a Staub coq au vin Dutch Oven, along with wooden and silicon cooking utensils over open gas flame. Your cooking times may vary if you use different materials or heat sources so be sure to keep a close eye on the pot until you have adjusted it for your own home. 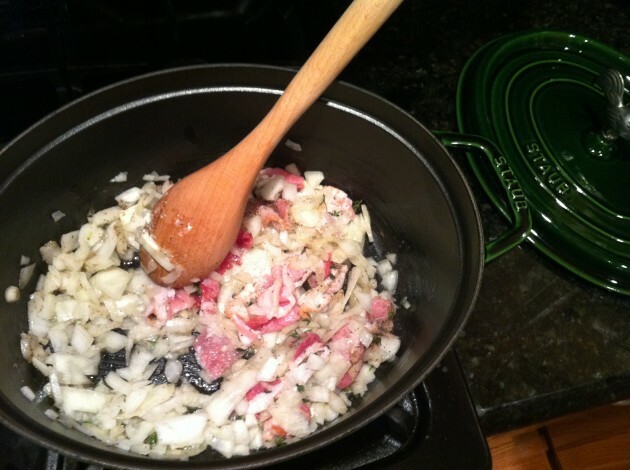 With the butter melted in the Dutch Oven, add the first bowl (containing the onion, bacon, thyme, salt, and pepper). Stirring frequently, cook the mixture until the onions begin to soften and turn a golden brown color. This should take 7 to 10 minutes. The browning process should take 7 to 10 minutes. You will know it is done when your onions have turned a beautiful golden color. In this picture, the onions are not yet ready. With this step you will need to be quick because if you over do it, you could begin to burn your corn chowder base and cause problems. Quickly stir in Bowl #2, which contains your flour. Depending upon your heat and the material of your pot, this might take only 30 seconds to 2 minutes to complete. Then, immediately go to the next step. Slowly add the water in Bowl #3 to the corn chowder base, whisking the now watery brew in front of you until it begins to boil. 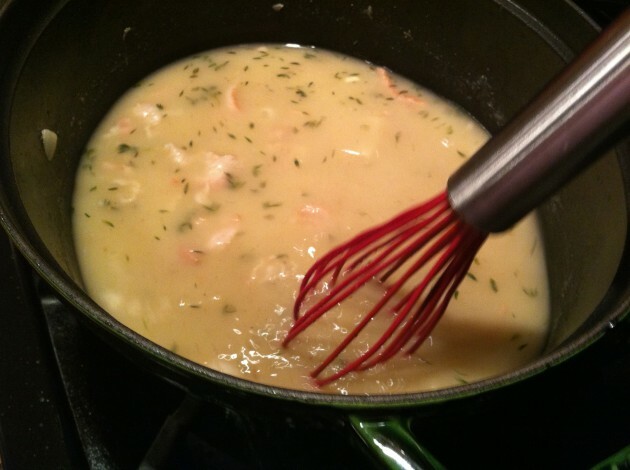 Once you have slowly added water, you need to whisk the corn chowder base constantly until it begins to boil. 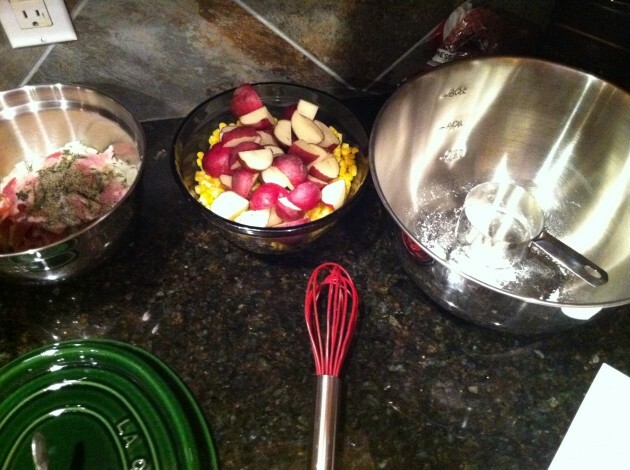 Once your mixture is boiling, stir in Bowl #4, which contains your corn kernels and the red potatoes. Switch back to a wooden spoon or whatever other utensil you were using earlier since the whisk won’t be strong enough to move around the new consistency, and continue to stir until the pot is simmering. This should only take a few minutes. Once the simmer has been reached, immediately reduce the heat from Medium to Medium-Low and let the mixture cook until the potatoes are softened. 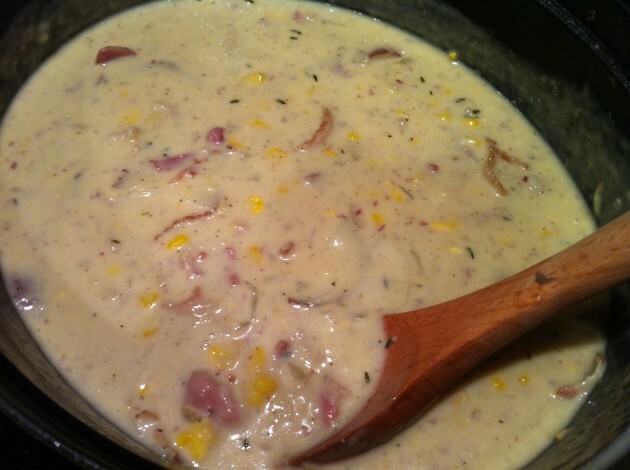 You should keep the Dutch Oven uncovered so the water can evaporate and thicken the corn chowder. Stir occasionally to prevent burning. This step took us around 20 minutes but it may take a bit less (or more) time depending on your stove and cookware. Scoop 2 cups of corn chowder mixture out of the Dutch Oven once you have completed the last step and put it in a food processor or blender. Puree it until has become completely smooth, which will take somewhere between 30 seconds and 2 minutes. Once that is done, dump the corn chowder puree back into the Dutch Oven, which is still cooking on the stove at this point. Mix well. Add your final ingredient bowl, Bowl #5, which contains your half-and-half or heavy cream. Constantly mix your corn chowder until it is once again simmering but be careful not to allow it to boil now that you have introduced dairy! 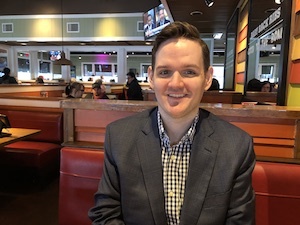 You don’t want to lose all of your effort at this point by causing it to curdle. Once it has simmered, add a large, heaping tablespoon (or more) of sugar, season with salt and pepper to your preferred flavor profile, and then serve. Top with freshly chopped basil and pair with a white or wheat French baguette. We served ours with freshly brewed sweet tea because we like the corn chowder hot (as in peppery / spicy) and the juxtaposition of sugar and spice is nice. The total cooking time, with preparation, is between 30 minutes and 60 minutes. The corn chowder recipe should serve 4 to 6 people, varying with the serving bowl size you use. If you are going shopping, here are the short-lists.